How Has the Economy Fared Since the Last FOMC Meeting? The biggest event risk this week is tomorrow’s FOMC rate decision and unfortunately the Fed could serve up a big plate of disappointment. Recent economic data has been mixed. 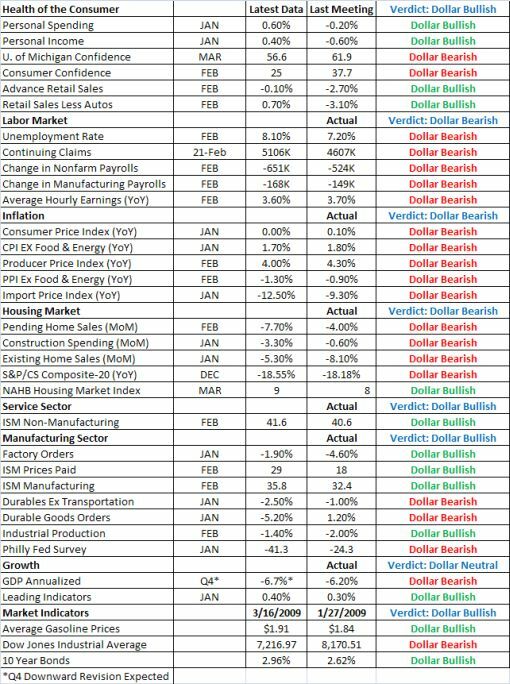 The following chart which illustrates how economic data has changed since the January FOMC meeting and we can see that there have been improvements as well as deterioration. There is not enough here for the Fed to jump gun and announce that they will start to buy U.S. Treasuries. I expect the script to remain the same with all of the key points from the January FOMC statement to be repeated. There are 2 other potential outcomes for Wednesday’s Fed meeting, but I deem them unlikely. With more than 5 million Americans out of work, the odds certainly favor more weakness than strength in the coming months. In fact, it is almost hard to believe that consumer spending has not collapsed given the severity of this recession. In order to make an intelligent decision, Bernanke may opt to wait another month to see how the economy responds to the TALF program before unveiling any new initiatives. It will be encouraging for the Federal Reserve however that the stock market is off its lows, consumer spending is holding steady and the housing market is rebounding. Easier monetary policy could still be needed but now may not be the right time for the nuclear decision of buying long term Treasuries. We expect the script to remain the same with the Federal Reserve reiterating that economic conditions warrant “exceptionally low levels of the federal funds rate for some time” and “they stand prepared” but make no commitment to buy longer term Treasury securities. They will also promise to use “all available tools” to stimulate the economy. This outcome should be dollar bullish because it means that the central bank does not need to immediately print more dollars to expand their purchases.